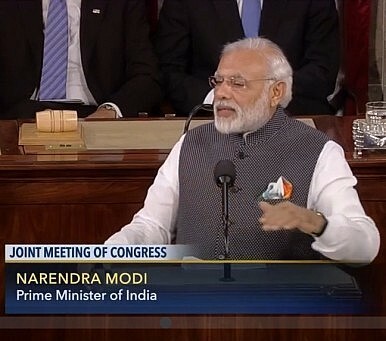 In this context, Modi’s speech to Congress (full video here and transcript as prepared here), delivered in English instead of the prime minister’s preferred Hindi, offered a comprehensive survey of India’s aspirations, both for itself and for its partnership with the United States, and charted a path forward for the bilateral. Moreover, at a time when a particularly strange election cycle in the United States has thrust inward-looking isolationist impulses on foreign policy to the forefront of the national discourse, the Indian prime minister’s remark offered insight into how the leader of a major rising power conceived of a productive U.S. role in the world. Modi seized the occasion to outline India’s grievances over what it sees as Pakistan’s continued inaction against and, in certain cases, active support of terror groups based on its soil. Without mentioning Pakistan by name, Modi warned Washington and New Delhi should “deepen [their] security cooperation and base it on a policy that isolates those who harbor, support, and sponsor terrorists.” No doubt that line earned nods of approval in the room–after all, it was congressional initiative that killed a recent U.S. bid to sell F-16 Block 52 fighters to Islamabad, subsidized by U.S. taxpayer funds. Beyond highlighting practical areas for cooperation and common interests, Modi even managed to imbue his remarks with some levity and cultural references. Poking at increasingly spare U.S. bipartisanship and his own party’s lack of control over the Rajya Sabha (the upper house of India’s bicameral legislature), Modi remarked that he was “informed that the working of the U.S. Congress is harmonious.” He continued: “I have also witnessed a similar spirit in the Indian Parliament, especially in our Upper House.” Finally, he wrapped up his remarks with a call out to Walt Whitman. Modi, the first Indian prime minister to be born in independent India and the first since Rajiv Gandhi to enjoy a commanding majority in the lower house of India’s parliament, spoke authoritatively for India, drawing repeated standing ovations from U.S. lawmakers. His reception in Washington underlined a bipartisan consensus in favor of closer U.S. ties with India. Where the U.S.-India relationship has seen its ebbs and flows and even succumbed to occasional bouts of mistrust, Modi seems determined to open a new chapter with Washington. Assuming broader U.S. policies in Asia see continuity following Obama’s departure from office in January (essentially, presupposing a Hillary Clinton victory in November), Modi’s big message seems to have been that India deserves sustained attention and a place at the top of the U.S. agenda in Asia. Indeed, Tuesday’s designation of India as a “major defense partner,” a bespoke status that confers on New Delhi similar treatment as the U.S. closest allies on arms trade, suggests some progress to this end. Modi’s mission, of course, isn’t just about the United States and India tackling the challenges of the 21st century as all-but-allies-in-name. He’d like to see far greater economic engagement between the two countries and continued bilateral rapprochement on a range of issues. There’s work to be done here, but Modi’s big speech suggests bilateral convergence will continue with fewer obstacles and road bumps than in the past.